The Buffybot is one of the more random ideas that turned into a key aspect of the show as what was originally commissioned by Spike as a way for him to deal with his crush on Buffy especially after she flat out rejected his advances unsurprisingly seeing how he spent the best part of his pre-behaviour chip life trying to kill her and post chip life trying to aggravate her as much as possible it seems. For some reason though the idea resonated with the fans and she would show up in brief appearances later in the series. Thankfully the creation goes a lot deeper than being essentially a sexbot for Spike and here they atleast attempt to do something interesting with the idea. While the Buffybot might be Sarah Michelle Gellar puling dual roles in the episode, here she really sells the idea of this robot version of Buffy which is completely devoted to Spike, while at the same time programmed with the basic information of the Scoobies broken down into fun factoids on its system screen such as “Anya: Dates Xander. Likes Money” or more amusing “Willow: Best Friend. Gay (1999 – Present)” which makes for some interesting interactions with the group who for some reason don’t question this version of Buffy’s strange behaviour. Despite being a creep for the most part, something certainly not helped by the fact he commissioned a sexbot….I mean Buffybot, Spike this week goes some way to redeeming himself as he spends the second half of the episode being tortured by Glory who quickly sees that Spike is a vampire and hence can’t be the key. 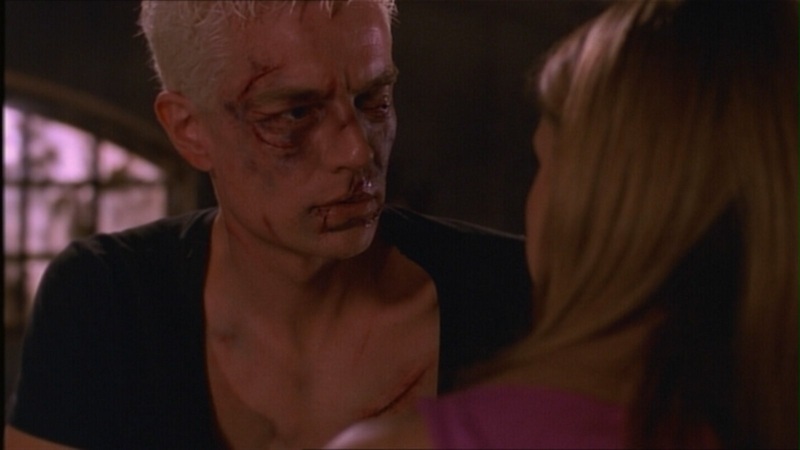 Considering how quick Spike has been previously to side with the enemy, especially if it can benefit his own motives it’s surprising that he didn’t once more try to double cross Buffy and the Scoobies to save him own hide and actually holds out on revealing the identiy of the key biding his time until he make his escape which is actually a pretty tense escape scene while handily timed so that it coincides with Buffy and Xander busting into Glory’s lair. I have to question though were Xander got such flashy axe skills, especially when we never see him training or doing anything weapon based apart from when he’s out in the field. The spirit quest while perhaps a more subtle scene than you perhaps expect it to be does give us another interaction with the first Slayer who for some reason now cites that love is at the core of every Slayer which is far from what you’d expect from her, especially when previous encounters have only served to highlight her feral nature and lust for battle. If anything though it only provides further hint at Buffy’s end game for the season which of course is only the more obvious for those of us re watching the series than the first time watchers. Abit of a mixed bag of an episode as it gives us so much and yet requires knowledge of what lies ahead to really appreciate everything that it gives us. Still for the Buffybot alone this one still has its moment throughout which makes it harder to dismiss as a lesser episode.